Ariete All New Riding Crows Pro Frame Technology: New design and shape to give a wider view, with a distortion-free frame and are OTG; will fit over most prescription glasses. 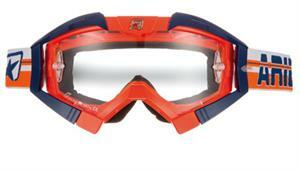 All lenses, tear-offs and film accessories are compatible with all Ariete goggle models. Made in Italy. Compatible with the range of Ariete accessories.